Many of my friends have kicked sugar out of their diets. The most common substitute is stevia. Unlike other zero calorie sweeteners, stevia is all natural. The stevia plant is part of the Asteraceae family, related to the daisy and ragweed. Several stevia species called “candyleaf” are native to New Mexico, Arizona and Texas. But the prized species, Stevia rebaudiana (Bertoni), grows in Paraguay and Brazil, where people have used leaves from the stevia bush to sweeten food for hundreds of years. In traditional medicine in these regions, stevia also served as a treatment for burns, colic, stomach problems and sometimes as a contraceptive. NuNaturals was quite generous in sending us many samples of their stevia products, as well as countless recipes available on their website. I can’t wait to start cooking! NuStevia Cocoa Syrup is here! Use NuStevia Cocoa Syrup on ice cream, coffee, and to make healthy chocolate milk. Also great for cooking. The rich chocolate syrup taste will instantly transport you back to the days of your childhood, without the sugar and unhealthy additives. This is a mom’s best friend! Give your kids the chocolate satisfaction they crave without the added sugar. NuStevia Simple Syrup is here! Simple syrup is traditionally used in many of your favorite alcoholic and non-alcoholic drinks. Use NuStevia Simple Syrup in cocktails, mocktails, and coffee. Now you can make delicious low-calorie, low-carb drinks. Also great for cooking. NuStevia Simple Syrup is perfect for making any recipe or beverage healthier by replacing sugar with an easy to measure, no calorie sweetener. uStevia Cocoa Mint Syrup is here! Use NuStevia Cocoa Syrup on ice cream, coffee, and to make other healthy chocolate drinks with a nice minty hint. Also great for cooking. This is a rich chocolate syrup with the finest Peppermint oil available. The Peppermint oil we use in our Cocoa Mint Syrup is grown right here where NuNaturals is located. The Peppermint oil grown in the Willamette Valley of Oregon is considered to be the best tasting Peppermint oil available. While other Peppermint oils may cost half as much, none come close to the flavor of our Willamette Valley Peppermint. NuNaturals introduces a great way to increase the fiber in your diet. A great addition to your favorite recipes. NuGrain™ Oat Fiber is naturally produced from food-grade oat hulls through a proprietary process. This is a chemical-free process, turning organic hulls into various organic fibers. Oat fiber has many uses in baked goods, adding to smoothies, porridge, and other recipes where you want to boost the fiber content of the foods your eat. Lemon NuStevia Alcohol Free Liquid is finally here. Once you have add this to your tea or coffee, yogurt, or sparkling water (makes an awesome sugar free soda), you will not know how you lived without it. We have been requested to come up with other flavors in the past since people rave about our Vanilla Stevia products. Problem was we couldn’t figure how to produce quality flavors. Other flavored Stevia products on the market are weak. We didn’t want to put out a product unless it REALLY tasted great. We did it. Orange coffee is awesome. Add our Lemon NuStevia to tea and you will REALLY taste the lemon. Orange NuStevia Alcohol Free Liquid is finally here. Once you have add this to your tea or coffee, yogurt, or sparkling water (makes an awesome sugar free soda), you will not know how you lived without it. 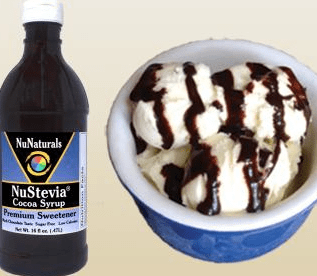 Two great flavors combine to make a spectacular Stevia liquid extract. Add to your seltzer to make a Dr.NuNaturals soda! NuNaturals has developed this easy to use liquid that allows the most accurate measurement of Stevia Extract. This liquid is so concentrated, that only 5-10 drops are needed. Same Pure Liquid Clear Stevia in the glass bottle, but the convenience and lower price of a plastic bottle. Built in squeeze dropper top. Our Pure Liquid Clear NuStevia Extract contains 200 mg per ml and is in a base of vegetable glycerine and 20% pure grain alcohol. Clear Stevia comes in a 2 oz bottle. Great for teas and other beverages. A very Cherry Stevia liquid extract. If you love the taste of Cherry as much as we do, try some today. You will be delighted how it tastes in Lemonade, Yogurt, and liven up your tea. This is a superior product. We use only Peppermint grown right here in the Willamette Valley of Oregon. This Peppermint is known to be the best quality Peppermint in the World. It cost NuNaturals more to use this high quality Peppermint, but we know you will taste the difference. This is a truly amazing product. If you love NuNaturals NuStevia, this is a product that you must try. This is not merely a Vanilla flavored Stevia liquid like so many others on the market. This is a true Vanilla extract made from premium bean that produces a product with incomparable taste. Once you have add this to your tea or coffee, yogurt, or lemonade, you will not know how you lived without it. NuNaturals has combined Singing Dog Vanilla with our delicious Stevia. Now you can have the delicious taste of vanilla bean extract with our amazing Stevia. Our Alcohol Free Stevia Extract contains 140 mg per ml and is in a base of vegetable glycerine. NuStevia™ NoCarbs Blend™ uses Erythritol, a natural filler that is produced from corn. Erythritol enhances the taste of Stevia. NuStevia™ NoCarbs Blend™ will have absolutely no effect on blood sugar levels and is safe for both Type I and II diabetics. White Stevia Extract and fiber. These marvelous tabs are a pre-measured serving. The tabs are very easy to break into halves or even fourths so that you can use as much as you want or as little as you want. NuStevia Quick Dissolve Tablets contains absolutely no calories or carbohydrates. White Stevia™ Extract Powder contains the flowing agent maltodextrin, a food grade carbohydrate derived from grain. Tasteless, maltodextrin is the perfect medium to use with the extract, making it easier to measure. This form is perfect for sprinkling on cereal, yogurt as well as mixing in beverages. One quarter to three quarters of a teaspoon is the recommended serving. I do think your source of stevia is important, as many stevia powders are chemically processed. The Erythritol additive in the NoCarb Blend may cause an upset stomach in some, but typically that only occurs with large amounts of consumption. I have not tried all of these products, as NuNaturals was quite generous in their sending of samples. I think stevia is an acquired to taste for some. I tried the cocoa syrup in my latte yesterday hoping for a zero calorie mocha effect. I did not taste much of the chocolate but mostly stevia. I like stevia in my tea and for baking. I don’t like it in coffee. NuNaturals offers so many stevia options, but I think my favorite product is the oat bran! Stevia Rebaudiana Bertoni is a fantastic natural sweetener (a natural sugar substitute) that has been used for centuries by the indigenous cultures of the tropical and subtropical regions in South-America. The plant is known as Stevia, but in other parts of the world is also known as “Sweet Leaf”, “Sugar Leaf” or “Honey Leaf”. The thick, soft leaves contain steviol glycosides that give the sweet taste without the harmful side-effects of many other sweeteners, as it is 100% natural. The steviol glycosides do not affect the blood sugar level and that is why Stevia is commonly used by diabetes patients.